64. Another arrangement of jumping motion. Motion is communicated to worm-gear, B, by worm or endless screw at the bottom, which is fixed upon the driving-shaft. Upon the shaft carrying the worm-gear works another hollow shaft, on which is fixed cam, A. A short piece of this hollow shaft is half cut away. 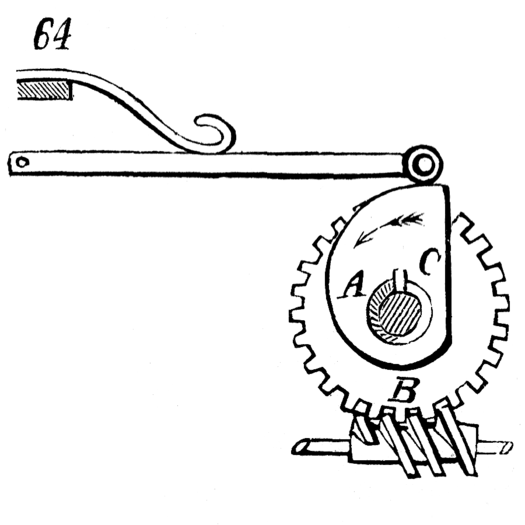 A pin fixed in worm-gear shaft turns hollow shaft and cam, the spring which presses on cam holding hollow shaft back against the pin until it arrives a little further than shown in the figure, when, the direction of the pressure being changed by the peculiar shape of cam, the latter falls down suddenly, independently of worm-wheel, and remains at rest till the pin overtakes it, when the same action is repeated.